Setting new benchmarks in energy efficient home cooling and ventilation, representing an evolution in the domestic application of innovative ‘hybrid ventilation’ technology. Ensuring you have long lasting comfort, Odyssey delivers you a cooler home and peace of mind with a 5 year warranty. Does Odyssey use the air in my roof space to circulate in the home? No, Odyssey only draws air out of the roof space or the home, depending on which is more beneficial under the current conditions. Does Odyssey draw dust and pollen into my home? You will have some dust and pollen enter your home if you have a window open, regardless of whether Odyssey is operating or not. Most of the dust and pollens entering come from people, attached to their clothing and footwear. How much will Odyssey actually cool my house? 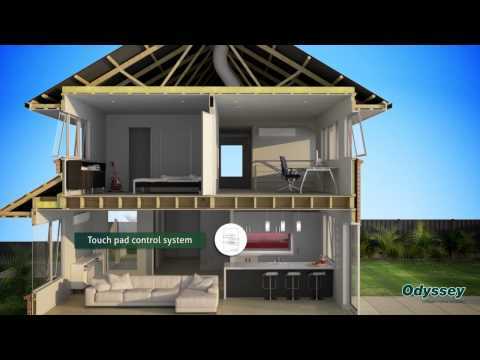 Given the variables inherent in house designs, it is impossible to provide precise guidance on what will happen to indoor room temperatures, however we do know that roof space temperatures can rise as high as 70°C, and vents can easily reduce this by 20-30°C, reducing the heat loads on your ceiling insulation and any air conditioning ducts running through the roof space. Why doesn't Odyssey have a filter like other ventilation systems? Odyssey removes the air from your home. There is no need to filter the air being extracted from your home. Fresh air enters your home though your doors and windows in the same manner as it would if you were to open your windows. The difference between Odyssey and some other home ventilation systems is that it doesn’t require an air filter which needs replacing. If I have another type of roof vent, like a Whirlybird or Windmaster, will these affect Odyssey and do I need to remove them? Your roof ventilator/s will continue to help reduce roof space temperatures and reduce the risk of winter condensation. They complement the operation of Odyssey during the day, when it will normally be exhausting air from the roof space. They do not interfere with the efficient operation of Odyssey as a home ventilation device. The advantage of Odyssey is that it will continue to operate when there is no wind. Can I use Odyssey instead of air conditioning to cool my home? If you are interested in reducing the running time of your air conditioning, Odyssey is a great complementary system. Odyssey is a ventilation system. It operates by exhausting warm air out of the home to draw cooler external air into the home, through a simple process of air exchange. On days of extreme temperatures, as the temperature rises, air conditioning will need to be used to deal with the peak temperature (hottest part of the day). As the temperature cools down, Odyssey can be used to introduce the cooler air into the home faster. For example, on a hot day, without Odyssey, you may run the air conditioner from 2pm to 10pm. If you were to install Odyssey, you may only run the air conditioner from 2pm to 6pm. That’s a 4 hour saving. If the kWh rate is $0.30, the running cost of a 5kW inverter split air conditioner, operating at 30% of its maximum power over a 4 hour period would be $1.80. Odyssey runs at a maximum of 55W, so the maximum cost of Odyssey running for 4 hours is 0.07¢. A lot less energy consumed and a big saving over the summer months! How much does Odyssey cost to run? Odyssey uses a maximum of 55W when running at full speed. As long as the settings are set correctly, it will only run when required. It is estimated that Odyssey will cost about $30 per year to run. This is based on a run time of 8hrs per day for 5 months and 3hrs per day for 7 months, at $0.30/kWh. Odyssey is a smart system that exchanges the air in your home, constantly monitoring the temperatures inside and outside with a controller and several sensors. In the warmer months, when the temperature inside your home is higher than the temperature outside your home the system turns on the roof mounted fan and rapidly draws air out of your home. At the same time, cooler air is drawn into your home from outside. The feeling of air movement in the home can be likened to that of a gentle sea breeze. In cooler months, if the temperature inside your home is cooler than the outside temperature, the system will activate to draw the warmer air into your home. The result is a more comfortable home that has a fresh air feeling.